"Europe slid over the edge of a cliff." Had Britain and France stood more firm in the face of Hitler’s aggression prior to his invasion of Czechoslovakia, and had it come to a fight, Germany would have been well outnumbered. France alone has one million men and superiority in both tanks and aircraft. The British had no army to speak of, but their navy was far stronger than Germany’s. The Czech army was nearly the equal (in number, anyway) of Germany’s. However, Chamberlain seemed determined to avoid a war — though with The Somme and Ypres barely twenty years behind them, you could scarcely blame the British for that — and he gave over the Sudetenland. The French had convinced themselves of two things: that defense would win the day (hence their commitment to the Maginot Line), and that they were badly outnumbered by the Germans. Given that, and given the bias my education has had toward the western allied powers, I’m altering my four-book plan. 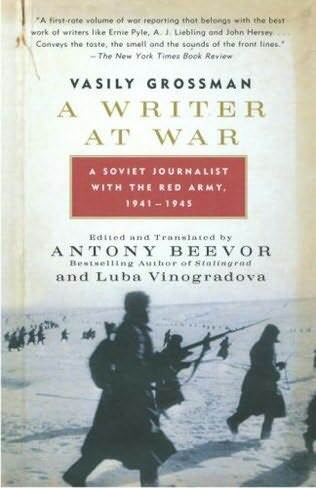 I’ve begun reading something which should give me a much closer look at the Russian side of the war called A Writer At War: A Soviet Journalist with the Red Army 1941-1945 by Vasily Grossman. The battle of Stalingrad alone fascinates me, as it might have been the singular turning point of the war in Europe, but if the reviews I’ve read are any indication it should be worthwhile. Grossman was one of the few writers who didn’t simply act as a mouthpiece for Stalin, and the carnage inherent in this phase of the war, so often glossed over, should come out.